Energy Trend Tracker has moved! Click here to visit the new site. 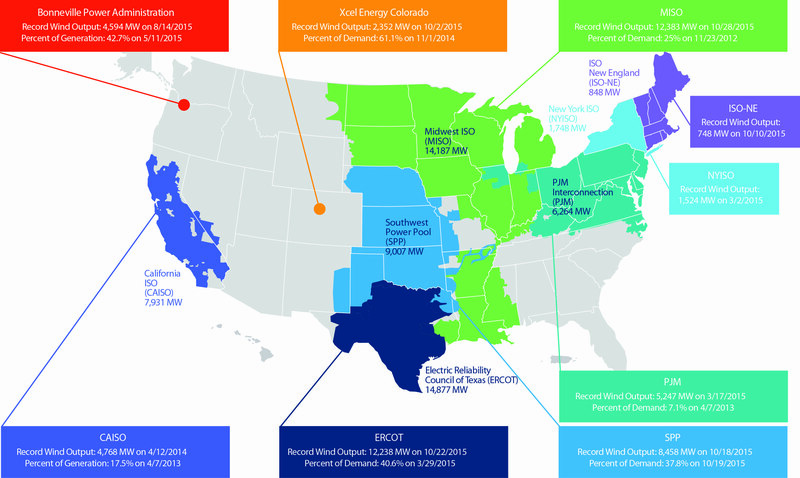 Recent developments and data that help track the trends on coal and renewable energy. April 2016: A small but growing number of once-skeptical Republicans is embracing wind and solar energy as renewables add plentiful jobs in states like North Carolina, Georgia and Texas. Several factors are behind the conservative surge toward renewables. The first is economic; as prices drop and clean energy becomes less reliant on subsidies, supporting it is less problematic for Republicans. It is a powerful job creator, with wind and solar jobs now numbering four times as many as the coal sector. And wind and solar farms are often built on farmland, providing rental income for farmers and others in typically conservative parts of the country. 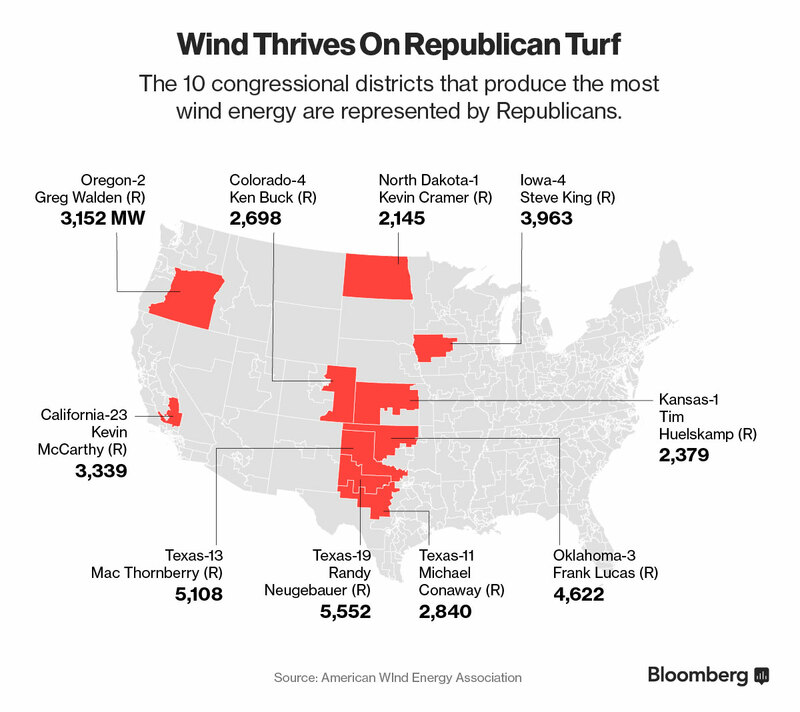 In fact, all of the top 10 wind-energy producing congressional districts are represented by Republicans, according to The American Wind Energy Association. April 2016: For the second year in a row, India’s renewable energy sector has surpassed target growth, by a substantial margin. In fiscal 2015-16, India beat its target of 4,460 MW of new renewables by more than 50%, adding 6,937 megawatts of new capacity. Solar was the big winner, with installations more than doubling the initial expectations. India also hit two major milestones: total installed wind capacity reached 25 gigawatts and for the first time, new solar additions were on par with new wind. April 2016: Virginia could become a hub for the offshore wind industry and see as many as 14,000 jobs created over the next 15 years as the sector grows, according to a report issued by a group called the American Jobs Projec in collaboration with researchers at Virginia Tech. The report said the state is particularly well-positioned for the placement of offshore turbines because of port infrastructure such as at Hampton Roads, which could become an East Coast hub for shipping turbines and their components. 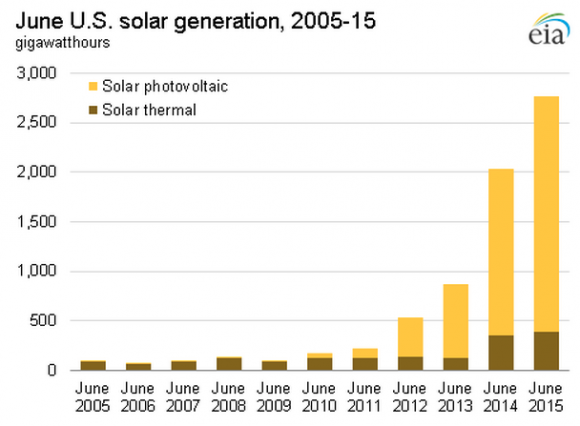 April 2016: How mainstream is solar becoming? IKEA has begun selling solar panels online and at three stores in the United Kingdom, and will make them available for purchase at all its stores by the end of the summer. The Swedish furniture giant decided to enter the market despite huge government cuts to solar subsidies for homeowners in Britain, saying it was confident there is still demand for the panels. “Our research showed a third of homeowners would really like to invest in solar, and the majority of those are driven by the opportunity to save money,” said IKEA’s head of sustainability at in the UK and Ireland. April 2016: Solar energy prices in India hit a new record low in January, and the country’s energy minister said solar would likely beat coal on cost. Speaking at the release of a new action plan for India’s renewable sector, Piyush Goyal said he thinks “a new coal plant would give you costlier power than a solar plant.” The winning bid in the January solar auction was for 4.34 rupees a kilowatt-hour, on par with coal prices that range between 3-5 rupees/kWh. As a result of solar’s increasing competitiveness, Goyal said India would quintuple its current target of 20 gigawatts of solar power generation by 2022 to 100 gigawatts. April 2016: In a symbolic milestone, solar has provided British homes and businesses with more power than coal-fired power stations for the first time ever over an entire day. 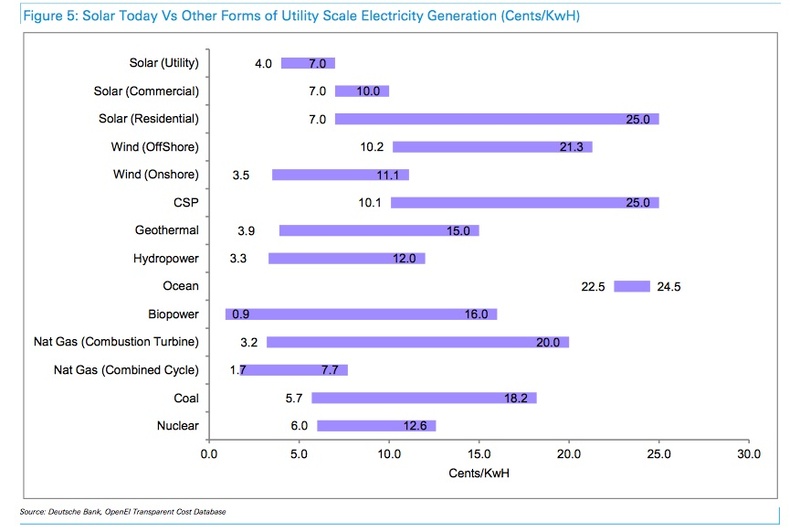 Data gathered by climate analysts Carbon Brief showed that solar provided the UK with 29 gigawatt-hours on April 9, compared with 21 GWh from coal. “This first for solar reflects the major shifts going on in the electricity system,” said Carbon Brief in an analysis. England now has 12 gigawatts of solar capacity, out of the UK’s total capacity of 80-90 GW. Meanwhile, while there was around 18GW of coal capacity going into last winter, this year there will be less than 10GW. April 2016: With economies of scale finally ramped up, wind and solar are crushing fossil fuels on cost. According to Bloomberg New Energy Finance, the cost of solar has fallen to 1/150th its level in the 1970s, and the total amount of installed solar has soared 115,000-fold. Since 2000, the amount of global electricity produced by solar power has doubled seven times over, and wind power has doubled four times over. 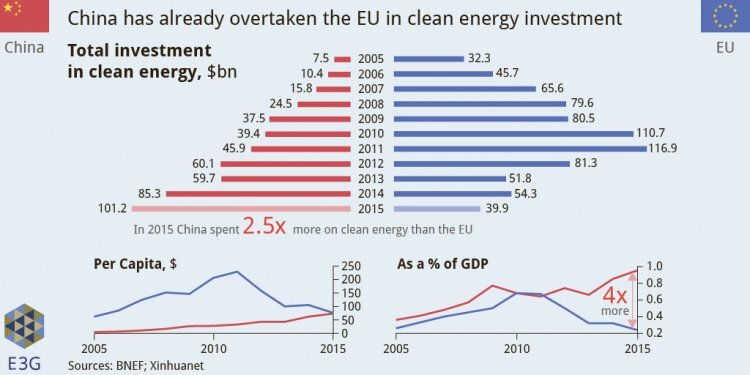 March 2016: By building infrastructure for cleaner electricity at a speedy clip, China is poised to overtake the European Union in a number of low-carbon economic measurements that will soon make it the dominant force in global clean energy development. According to a report by analyst group E3G, China’s new five-year plan lays out a plan to more than double its wind energy capacity, nearly triple its solar capacity and increase electric vehicle sales by a factor of 10. Chinese R&D spending on clean energy has risen 73% in the last five years, compared to just 17% in the EU. March 2016: Rooftop panels could provide 40% of the electricity demand in the U.S. and as high as three-quarters in California, the most bullish state on solar, according to a new study from the National Renewable Energy Laboratory. A previous NREL study in 2008 determined that solar could supply about 21% of the country’s electricity demand, around 800 terawatt-hours a year. Improvements in the efficiency of panels and more accurate data analysis upped the estimate by 79% to 1,432 terawatt-hours annually, which would meet around 39% of U.S. electricity demand. March 2016: Growth in community solar programs over the six years is a further indication of the dramatic shifts taking place in energy markets. Community solar projects, or gardens, allow customers to buy shares of larger projects even if they can’t install solar panels on their own roofs. 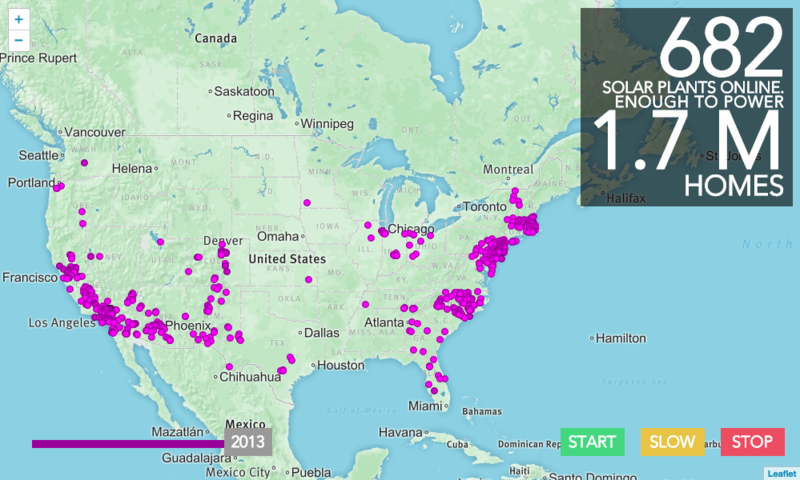 In 2010, there were only two shared solar projects in existence in the United States. Today, 77 utilities administer more than 110 projects across 26 states, accounting for a total capacity of about 106 megawatts, according to a new report by Deloitte. March 2016: Clean energy jobs are proving to be an economic powerhouse in the Midwest, with more than a half million workers employed in various sectors – renewable energy generation, clean transmission, energy efficiency, clean fuels and advanced transportation – according to a recent survey. Illinois led the pack with more than a fifth of the region’s 568,979 clean energy jobs. Looking ahead, clean energy employers project a growth rate of approximately 4.4% over the coming 12 months, which will add around 25,000 jobs and outpace the average employment growth rate over the next 10 years by a factor of nine. March 2016: After five years of review, the U.S. Department of Energy has decided to participate in the Plains & Eastern Clean Line Project, which will carry 4,000 megawatts of low-cost wind energy from Oklahoma and the Texas panhandle to the Southeast. The 700-mile Clean Line will deliver wind power to more than 1.5 million homes and businesses in Tennessee, Arkansas and other Southern states. DOE will help secure the transmission route, if and only if the developer can’t reach agreement with a state (Oklahoma and Tennessee have already endorsed the project). 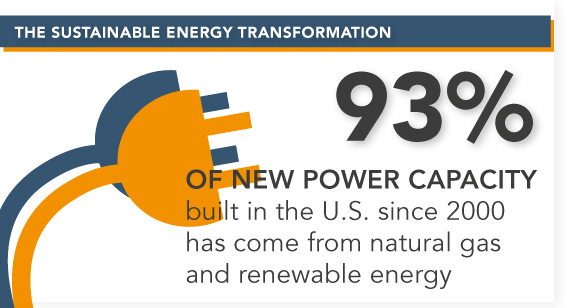 March 2016: In the first month of 2016, 100% of new electrical generating capacity in the U.S. came from renewable energy projects. According to the latest Energy Infrastructure Update report by the Federal Energy Regulatory Commission, there 468 megawatts of new wind and 145 MW of new solar added in January. No new capacity for nuclear, coal, gas or oil was reported. 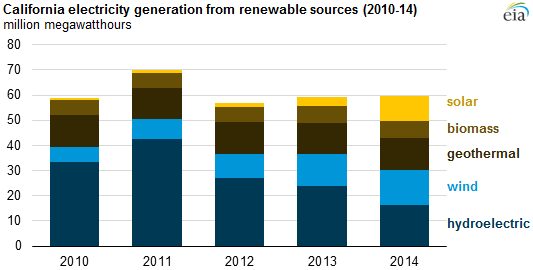 Renewables accounted for 64% of all new electrical generating capacity installed in 2015. 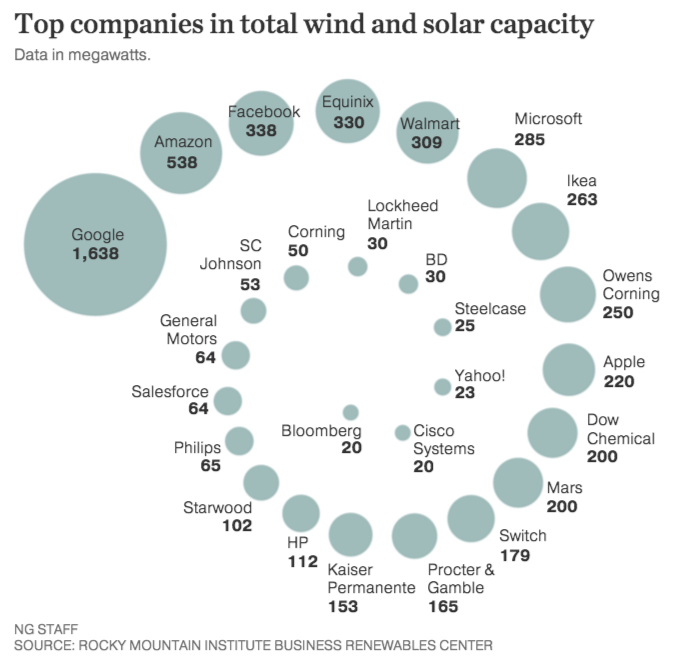 March 2016: Digital-age companies like Google, Amazon, Microsoft and Apple still dominate the leaderboard for corporations turning to clean energy, but increasingly they are being joined by industrial and manufacturing stalwarts such as Lockheed Martin, Dow Chemical and Owens Corning. These companies recently signed long-term deals to buy clean energy to power their operations, taking advantage of wind and solar costs that continue to fall. March 2016: Two massive energy storage battery systems installed in South Korea, which will be used to help regulate frequency variations on the grid, are expected to save the country’s largest utility millions of dollars. Korea Electric Power Corporation expects the two systems, one 24 megawatts and one 16 MW, to improve grid efficiency, allowing it switch to lower cost energy sources and cut down on wear and tear on plants and transmission equipment. The storage systems are expected to save the utility $13 million annually in fuel costs alone, three times the cost of the batteries. 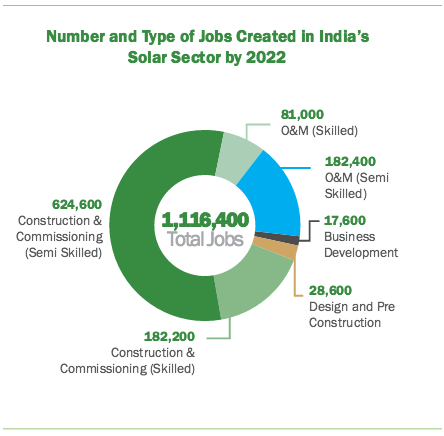 February 2016: India’s plans for a massive expansion of the nation’s solar sector could create more than 1 million new jobs, according to an analysis by the Natural Resources Defense Council and the Council on Energy, Environment and Water. The country has set a goal of adding 100 gigawatts of solar capacity by 2022. The analysis found that the build-out would require 210,800 skilled engineers, 624,000 construction works and 182,400 low-skilled workers for ongoing project operations and maintenance. The analysis does not take into account manufacturing jobs, which could also be significant. February 2016: As part of a move to become more energy independent, Morocco has officially flipped the switch on the first phase of what will be the world’s largest concentrated solar power plant. The Noor I power plant, located on the edge of the Sahara Desert, is capable of generating up to 160 megawatts of power. The next two phases will add another 300 MW of solar capacity. Combined, the three plants will provide enough energy to serve more than a million people. Using molten salt technology, they will also be capable of generating electricity after nightfall. Morocco currently relies on imported sources for 97% of its energy consumption. January 2016: The main electricity provider for the the Canadian province of Nova Scotia set a new renewable energy record in 2015, with wind, hydropower and biomass contributing 26.6% of its electricity over the course of the year. The total exceeded the benchmark of 25% required by law. Nova Scotia Power said it is on target to meet the 40% renewable requirement by 2020. As recently as 2007, only 9% of Nova Scotia’s electricity came from renewables. Just as notable, utility officials said the transition is helping stabilize power rates. For most customers, rates did not increase in 2015 and have gone down in 2016. Wind makes up the lion’s share of the new generation being addd in Nova Scotia. January 2016: World-wide revenue for utility-scale battery energy storage is forecasted to grow 1,500% over the next decade, expanding from $231.6 to $3.6 billion by 2025, according to an analysis by Navigant Research. Buoyed by new business models and financing investors are pouring money into new generation batteries that helps stabilize the grid and improves the economics of individual generating facilities. The increased investment is expected to lead to even bigger growth in storage capacity, which is projected to expand 30-fold to 42.7 gigawatt-hours by 2025. ability of the grid. January 2016: With a rapid expansion of its solar capacity driving the market, India is seeing record low bids come in for new projects>. In late 2015 and the beginning of 2016, there have been a wave of bids for solar costing in the range of $.07 per kilowatt-hour. Just a year ago, solar contributed almost none of the country’s power. By 2021 the Institute for Energy Economics and Financial Analysis estimates that solar will contribute 10% of India’s electricity. January 2016: After an effort to transfrom its energy that began just six years ago, the tiny nation of the Cook Islands in the South Pacific is now on track to provide 100% of its electricty with renewables by 2020. The country, comprising 15 islands southwest of Tahiti set its course for a transition to renewable energy in 2010 to wean itself off of expensive imported diesel-generated power. January 2016: The city of Santa Monica, Calif. has signed a contract that will supply all of its municipal operations with 100% renewable energy, most of it solar and wind power generated in California. The contract will provide clean energy for more than 500 city-owned accounts. 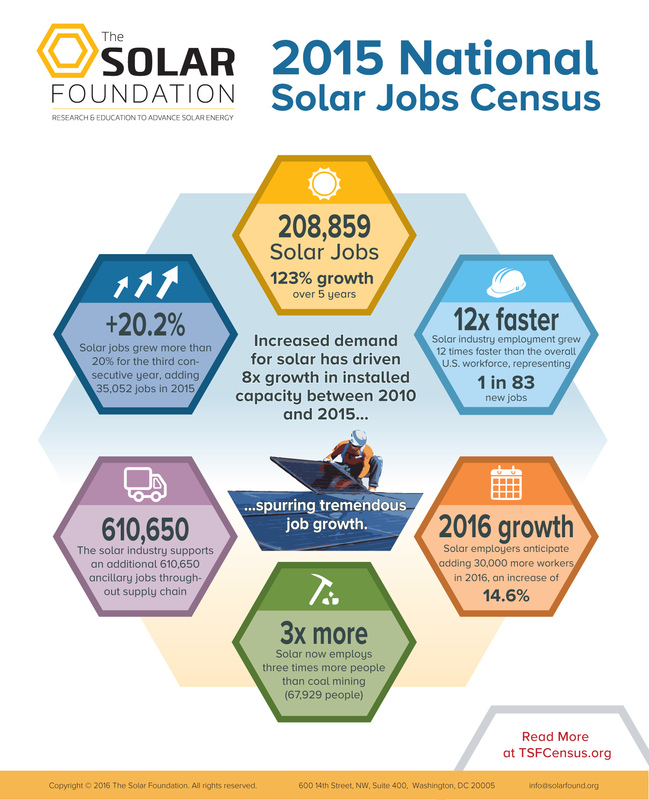 January 2016: Employment growth in the U.S. solar industry continued its rapid expansion in 2015, adding 35,052 new workers over the year, according to the latest annual jobs census by The Solar Foundation. With an employment increase of 20%, the solar sector grew nearly 12 times faster than the national employment growth rate of 1.7% last year. In fact, one out of every 83 new jobs created in the U.S. last year was in the solar industry. Since 2010, employment in solar has grown an extraordinary 123%, and projections are for that pace to continue. Companies surveyed for the census expect to see total employment in the solar industry increase by 14.7% to 239,625 solar workers in 2016. 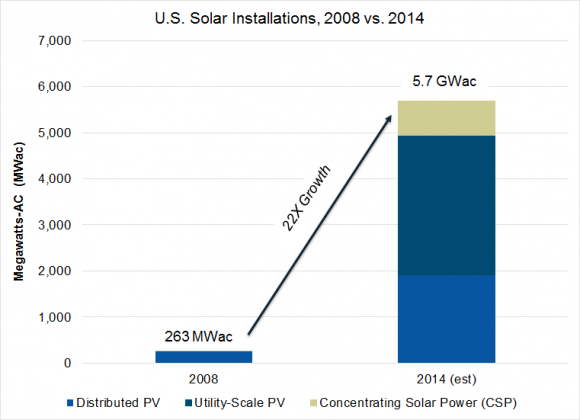 “Solar is surging. 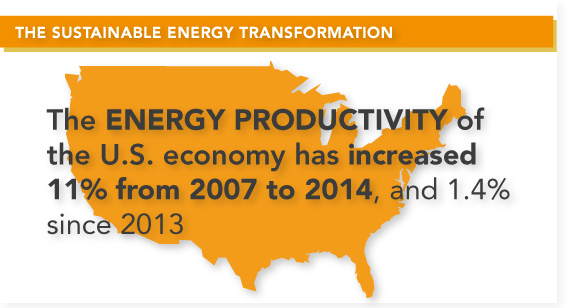 Renewable energy deployment is on track to transform our world,” said former U.S. Labor Secretary Hilda Solis. January 2016: In a unique new appiclation for solar, France will install flexibile, traffic-durable solar panels on 1,000 kilometers of roadway over the next five years, providing enough electricity to power public lighting for a city of 5,000 a thousand times over. The project is a private-public collaboration between French a transport infrastructure company Colas and France’s National Institute for Solar Energy. The panels, just 7 millimeters thick and made of layers of material “that ensure resistance and tire grip,” are glued on the top of existing pavement and strong enough to stand up to regular traffic, even heavy trucks. January 2016: Rapid expansion has made solar the top renewable energy source for the grid serving about 80% of California. According to California Independent System Operator data, utility-scale solar now comprises 6.7% energy on the system, wind 5.3% and hydropower 5.9%. If rooftop solar were also counted, it would increase solar’s share to nearly 10% of the state’s electricity. 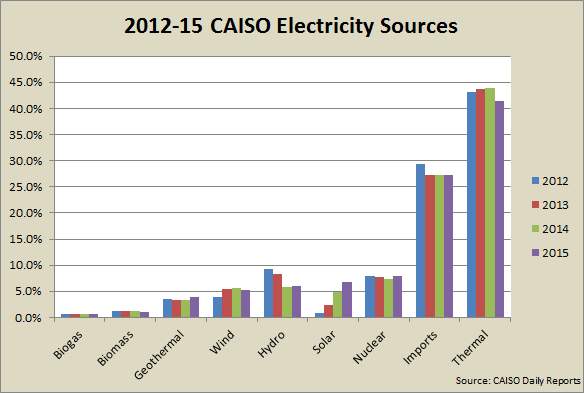 Three years ago, solar contributed just was 0.9% of CAISO’s generation mix. Renewables now account for 24.3% of the state’s energy, coal less than 1%. January 2016: A new study by federal energy researchers estimates that nationwide the net benefits of pollution cuts from state renewable portfolio standards collectively totaled $7.4 billion 2013, dwarfing the costs of the rules. The analysis, conducted jointly by Lawrence Berkeley National Lab and the National Renewable Energy Lab, calculated the net benefits of reducing greenhouse gas emissions at $2.2 billion and the benefits of cutting other air pollution – such as fewer lost work days and hospital visits – at $5.2 billion. January 2016: Saying the economics of photovoltaics are more attractive, a prominent developer of coal-burning power plants in India has changed course on a 800-acre site planned for a coal plant in the state of Punjab and decided to build a solar project instead. According to the report in Bloomberg, the decision is the latest example of India’s increasing interest in solar. Prime Minister Narendra Modi has set a target of installing 100 gigawatts of new solar capacity by 2020. The Indian government has created numerous incentives and regulations to attract overseas developers, a move that has reduced the cost of solar electricity to record lows. December 2015: The U.S. wind industry reached a new milestone in November, topping 70 gigawatts of installed generating capacity nationwide, enough to power about 19 million homes. According to the American Wind Energy Association, there are more than 50,000 wind turbines operating across 40 states and Puerto Rico. Wind suprassed the 50 GW and 60 GW milestones in 2012. In just eight years, wind power has gone from producing less than 1% of America’s electricity to 5% now. And with Congress enacting a 5-year extension of federal tax credits for wind and a new climate agreement in place from Paris, growth in wind is on-track to meet DOE projections for generating a fifth of the country’s electricity by 2030. December 2015: As part of the climate accord brokered in Paris, African nations have announced an ambitious goal to tap into the continent’s “massive potentials” for renewable energy by building at least 300 gigawatts of new clean energy capacity in the next 15 years. The plan, backed by commitments from a $100 billion annual fund pledged by wealthy countries to fight climate change, would double Africa’s total generating capacity, which currently is about half as much as Japan, a country with one-tenth Africa’s population. December 2015: The Pacific Northwest’s clean economy is growing at a rate twice as fast as the overall economy, according to a new study. The West Coast Clean Economy: 2010-2014 Jobs Update, compiled by the Delphi Group, looked at economic drivers in Oregon, Washington, California and British Columbia, which have a combined GDP of $2.8 trillion and together represent the world’s fifth largest economy. 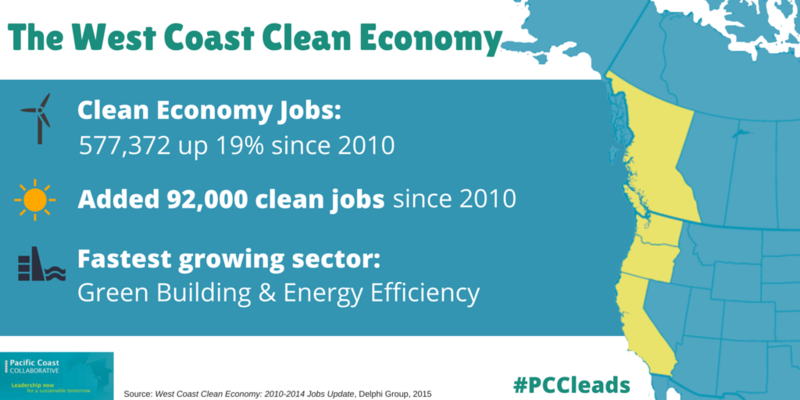 As of 2014, the region housed 577,372 clean economy jobs, an increase of 19% since 2010. December 2015: The city of Las Vegas will be powered exclusively by renewable energy, city officials have announced. As part of an expanded partnership with utility NV Energy that will provide a mix of energy-efficiency programs and a large-scale solar project, all fire stations, streetlights, city parks and other municipal facilities in Las Vegas will be powered completely by clean energy within two years. The move would make Las Vegas the largest city in the U.S. with municipal operations completely powered by renewable energy. City officials said the deal was possible due to dramatically falling costs; solar, for example, is roughly half the price it was just five years ago. “It’s cheaper than what we could build a new natural gas plant for,” NV Energy’s president told the Las Vegas Sun. December 2015: The newest update to Pennsylvania’s climate change action plan includes a significant expansion of renewable energy and added energy efficiency programs, as well as fixing methane leaks from natural gas pipelines and coal mines. The actions are some of the dozens of steps laid out by the state’s Department of Environmental Protection to help limit the damage caused by rising global temperatures, which the report calls “one of the most serious issues facing the world.” Pennsylvania is the third largest emitter of energy-related carbon dioxide in the country, but the plan has the potential to reduce greenhouse gas emissions by 338 million metric tons CO2 equivalents through 2030. December 2015: The vast majority of new electricity generation in Texas will come from renewable enegy, especially wind power, in 2016. The Electric Reliability Council of Texas, which manages nearly 90% of the state’s grid load, also projects that solar power growth will exceed natural gas capacity next year. In 2016, ERCOT anticipates adding more than 4,200 megawatts of new power capacity, including nearly 2,800 MW of wind power, more than 1,000 MW of solar and the remaing 10% from a new natural gas plant. By 2018, ERCOT expects the amount of solar on the grid in Texas to grow tenfold to about 2,000 MW. November 2015: Microsoft co-founder Bill Gates has made renewable energy his next big project, pulling together a multinational band of investors to pump billions in clean energy. The goal of the group, called the Breakthrough Energy Coalition, is to continue lowering the cost of clean energy to make it competitive with fossil fuels in order to get poor countries to make the switch without sacrificing economic growth. The coalition comprises more than two dozen public and private entities, including national governments, billionaire philanthropists, investment fund managers and tech CEOs. November 2015: Under new leadership elected earlier this year, Alberta’s provincial government has set a goal of getting a third of its electricity from renewable energy and completely phasing out coal by 2030. ”This is the day we start to mobilize capital and resources to create green jobs, green energy, green infrastructure, and a strong, environmentally-responsible, sustainable and visionary Alberta energy industry with a great future,” Alberta Premier Rachel Notley said in a speech during the plan’s roll-out. November 2015: October saw wind energy output records fall across the country as a result of a “wind rush” of projects and long-needed grid upgrades coming online. Both the Texas and Midwest grid operators passed the milestone of 12,000 megawatts of wind output in the third week of the month, trading spots for all time peaks for a regional grid operator. 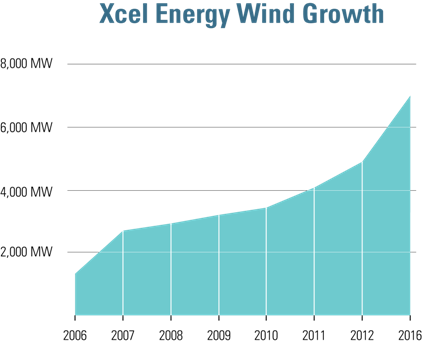 On Oct. 2, Xcel set a new record of 2,352 MW of wind output in Colorado. The grid operator for Oklahoma, Kansas, Nebraska, and parts of neighboring states, hit 8,458 MW of wind on Oct. 18, and the American Wind Energy Association is working to validate record outputs for grid operators in the Mid-Atlantic and Great Lakes regions, as well. October 2015: China’s solar capacity, already the biggest in the world, will balloon more than fourfold by 2020, according to a senior official. The Chinese government’s goal is to increase solar PV capacity by 20 gigawatts annually from 2016 to 2020. Total solar capacity will reach 150 GW over that timeframe, up from 35.8 GW this summer. October 2015: Utilities in New Mexico have announced three large-scale deals that will add 165 megawatts of solar to the state. Southwest Public Service Co., a subsidiary of Xcel Energy, has signed a long-term agreement to buy power from two 70 MW solar facilities being built near Roswell. Southwest will pay about 3.5 cents per kilowatt-hour starting in 2017, one of the cheapest power agreements in the nation for utility-scale solar and less expensive than some of Excel’s older natural gas plants. “The way the economics are changing, we’re often looking to add renewables now because of the economic value and the diversified mix of energy it provides for our system,” an Xcel splkesman said. Colorado-based Tri-State Generation and Transmission, also announced a deal to build a 25-MW solar facility in Luna County. October 2015: In signing a sweeping new law for a for a “decarbonized future,” Gov. Jerry Brown has put California’s clean energy policies even further ahead of the pack. The measure expands the state’s renewable energy standard, requiring it to generate half of its electricity from solar, wind and other renewables by 2030, and it doubles energy efficiency requirements for homes, offices and factories. Brown said the legislation was necessary both to combat climate change and to continue cleaning up air in cities where pollution is still problematic. The bill also lays the groundwork for a regional electricity grid, which could make renewable energy more available throughout the West. October 2015: A new nationwide poll shows that large majorities of Americans support renewable energy like solar, while coal is considered “the worst” energy source than any other form of energy. In the poll, conducted by the University of Texas at Austin, 41% of Americans said ranked solar energy as the best energy source for the country, while coal was ranked the worst by 40% of Americans, slightly ahead of the next least favorite, nuclear power. The poll also found that opposition to coal translates to support for candidates working to move us away from it as an energy source. October 2015: An analysis of the levelized cost of electricity worldwide showa average onshore wind and solar costs continuing to decline while those for coal and natural gas were on the rise for the second half of 2015. The Bloomberg New Energy Finance analysis, based on thousands of cost data points from projects around the world, found that the global average levelized cost of electricity for onshore wind fell from $85 per megawatt-hour in the first half of the year to $83 in the second half, while that for solar PV solar fell from $129 to $122. In the same period, the cost for coal-fired generation both increased. Onshore wind, the data showed, are now fully competitive against gas and coal in Europe. October 2015: China, which is already the world’s largest solar market, is set to more than quadruple its current capacity by 2020, a senior government official was quoted saying in the official state news agency. The director of new energy for China’s National Energy Administration told the Xinhua news agency that the government’s goal is to boost photovoltaic solar output by 20 gigawatts annually from 2016 to 2020, bringing the country’s total capacity to nearly 150 GW. China had 35.8 GW installed as of July. September 2015: After a decade of work, the city of Aspen, Colo., is now receiving all of its power for municipal buildings and operations from renewable energy sources. Aspen’s Utilities and Environmental Initiatives Director told the Aspen Times that even though just under 7,000 residents live in the city year-round the achievement was symbolically important because it “demonstrated that it is possible. Realistically, we hope we can inspire others to achieve these higher goals.” According to Climate Progress, Aspen is the third U.S. city to get 100% of its energy from renewables, joining Burlington, Vt. and Greensburg, Kans. September 2015: As part of efforts to continue combatting Hawaii’s highest-in-the-country electricity prices, the utility serving the island of Kauai is expanding its solar capacity with battery storage in order to cut costs with less expensive clean energy. The Kauai Island Utility Cooperative has signed a contract to buy power from a 17-megawatt solar PV project being built on the island. The project includes a 52-megawatt-hour battery storage system that will be used to feed up to 13 MW of electricity onto the grid to reduce the evening peak load from 5-10 p.m. KIUC will buy power at 14.5 cents per kilowatt-hour, more than 30% less expensive than the oil-based electricity typically need at night, which costs 22 cents per KWh. September 2015: A recent ruling by the Federal Energy Regulatory Commission may have removed one of the biggest obstacles to more clean energy development by rural electric cooperatives, which have lagged behind regulated utilities and remain one of the most coal-dependent energy providers in the utility sector. A Colorado co-op, Delta Montrose Electric Association, appealed to FERC to settle a dispute over its desire to buy clean power from a small local hydro-electricity producer. DMEA was stymied in its efforts by its “all requirements contract” with Tri-State Generation and Transmission Association, which generates a majority of the power it sells DMEA from coal. FERC ruled that the Public Utilities Regulatory Policy Act of 1978 supersedes contracts. Under federal law, power providers are obligated to buy power generated by “qualifying facilities.” The ruling doesn’t allow co-ops to develop their own clean energy resources beyond contractual limits, but it does open the door to outside clean energy developers getting around a big obstacle to sell their power to willing co-ops. 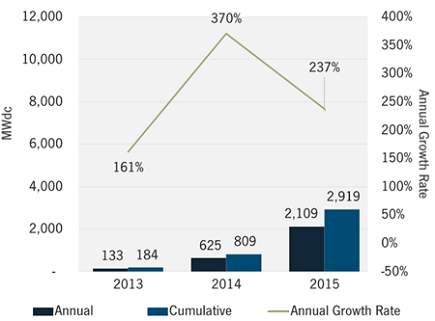 September 2015: The U.S. solar market remains on pace for yet another record-breaking year, with a strong second quarter and expectations for the last six months of 2015 to be significantly larger, according to a market analysis by GTM Research and the Solar Energy Industries Association. Overall, 1,393 megawatts of solar PV were installed in Q2 2015, the seventh consecutive quarter in which the nation added more than 1 gigawatt of PV panels. 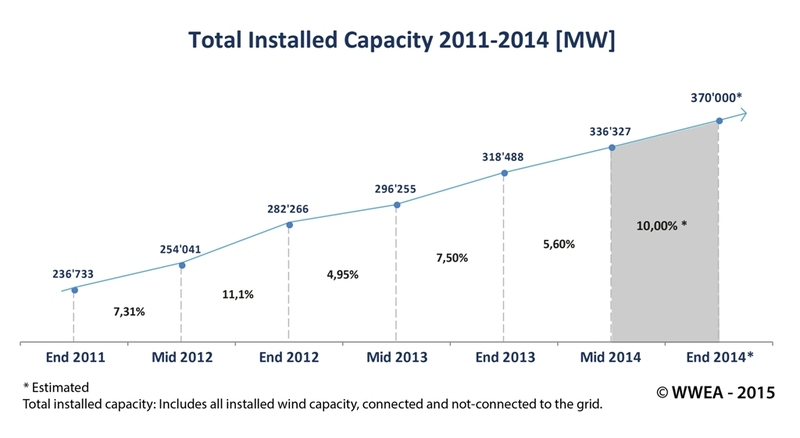 The second quarter also marked the milestone of cumulative installations eclipsing the 20 GW mark. 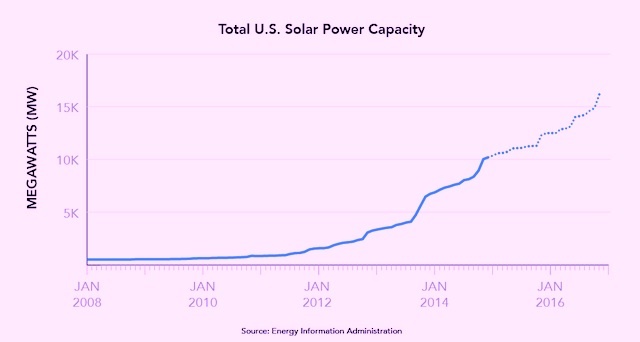 During the first half of 2015, 40% of all new electric generating capacity brought on-line in the U.S. came from solar. September 2015: A new report shows that America’s Top 10 states in solar energy have driven huge gains in the past three years. The nation’s rooftop solar PV capacity has tripled in the past three years as the cost of solar energy has fallen rapidly, according to “Lighting the Way,” a report by by Environment America, and the top 10 states have led the charge, now accounting for 86% of the nation’s total installed solar electricity capacity. The top 10 states are: Arizona, California, Colorado, Hawaii, Massachusetts, Nevada, New Jersey, New Mexico, North Carolina and Vermont. California has the most rooftop solar installed, but Hawaii has surpassed Arizona as the state with the most solar capacity per capita. September 2015: A new report by officials in Rhode Island says there are now nearly 10,000 clean energy jobs in the state. The state’s Office of Energy Resources and the Executive Office of Commerce said the clean energy sector added 613 jobs over the last 12 months, bringing the total to 9,832. The agencies also projected that another 1,600 positions in energy efficiency, renewable energy and related fields would be created over the next year. Job growth in clean energy hit 6.6% over the past year, a “remarkable” surge for such a new sector, said a separate report, that easily outpaced Rhode Island’s overall rate of less than 1%. a separate report found. The majority of new clean energy jobs — about 52.5% — are in energy efficiency, which includes retrofitting buildings. Another 11% were in renewable energy, including installation and construction jobs. September 2015: Speaking to reporters, U.S. Energy Secretary Ernest Moniz said that while the administration supports the extension of renewable energy tax credits, he sees solar continuing to grow even without subsidies because the value proposition is so favorable. Moniz cited data projecting that the cost of electricity from rooftop solar panels will soon fall as low as 6 cents per kilowatt-hour, making it “extremely competitive” with natural gas and other fossil and non-fossil power plants. September 2015: With the installation of a second solar project on county buildings in Yuba County, Calif., officials expect have all of the county’s facilities powered by renewable energy, and to be saving money. The county is spending $5.2 million to install 1.6 kilowatts of solar at the county airport but anticipates saving $16 million in energy costs over the next 30 years. A similar county solar project installed in 2011 at a cost of $10 million 2011 project helped cut the county’s annual power costs from about $1 million to $500,000 in one year. 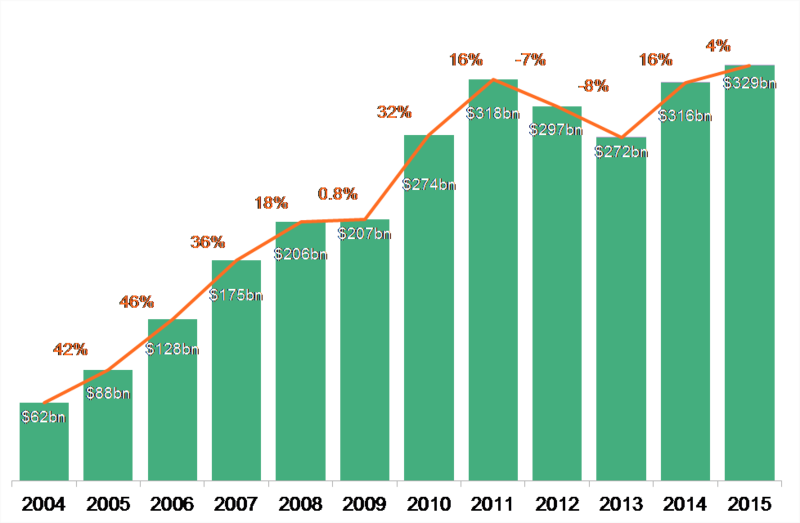 August 2015: After a slowdown in the growth of utility-scale solar in 2013 and early 2014, the sector has bounced back impressively, reports GreenTech Media’s Stephen Lacey. In the latter half of 2014, utilities around the country signed an unprecedented number of contracts for utility-scale PV projects, in large part because the technology had gotten so cheap. 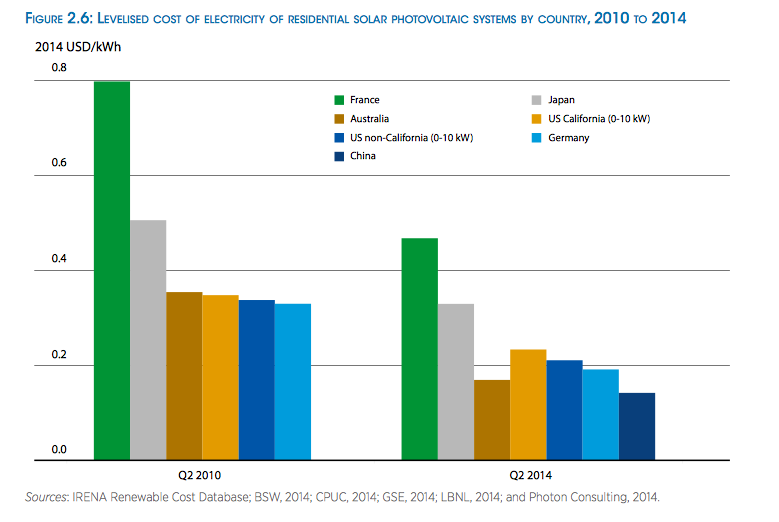 That momentum continues, with utility-scale solar hitting both cost and generation records. In June, for example, Austin Energy revealed that the average bid from developers in the second round of a 600-megawatt procurement averaged below 4 cents per kilowatt-hour. 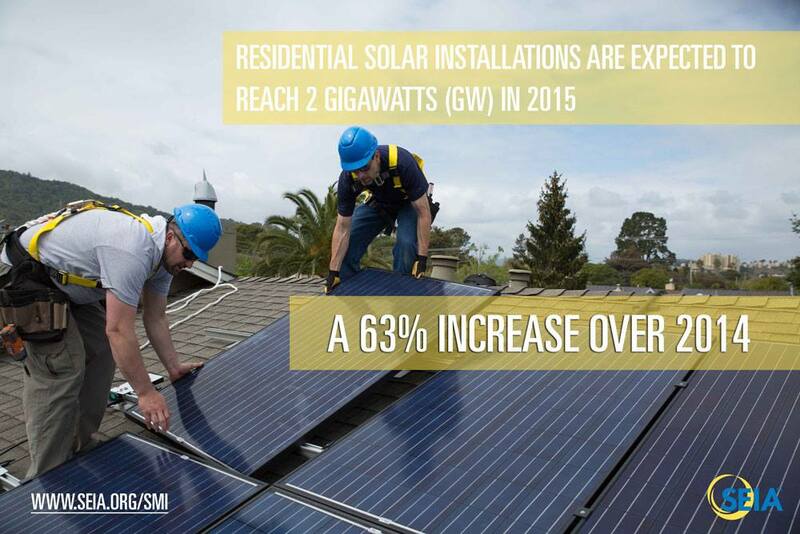 And in March, California became the first state to generate 5% of its electricity from utility-scale solar. Nationwide, the amount of electricity generated by utility-scale solar is 31 times higher than it was just a decade ago. August 2015: The amount of solar PV capacity installed worldwide will grow at a compound rate of nearly 20%, more than doubling to at least 480 GW by 2020, according to projections in a report by consulting firm Hexa Research. At the end of 2014, global solar capacity totaled about 178 GW. Until now, growth in solar has been driven by developed countries but in the future, a majority of demand will come from rapidly developing Asia Pacific markets like China, India and Taiwan, the report said. July 2015: Hewlett-Packard has signed a 12-year contract to buy 112 megawatts of power from a wind farm in Texas, the latest in a growing trend of nontraditional companies turning to clean energy. In February, Kaiser Permanente announced a 20-year contract to buy 153 MW of wind and solar power in California. A month later, Dow Chemical said it would buy 200 MW of wind power in Texas. And earlier this month, Amazon Web Services said it would build and operate a 208-MW wind farm in North Carolina. The HP deal will provide electricity equivalent to that used by 42,600 homes and will be sufficient to fully power the company?s data centers in Texas. July 2015: Alabama’s largest utility has asked regulators for permission to install up to 500 megawatts of solar and other renewable energy projects, a substantial change in direction in a state dominated by coal and lagging behind others in clean energy development. Alabama Power, which still needs approval from the Alabama Public Service Commission, will focus on projects up to 80 MW to serve large companies, not residential customers. A company spokesman said no additional costs would be passed on to customers as part of the project. Once built out, the 500 MW will account for 4-5% of Alabama Power’s total capacity. 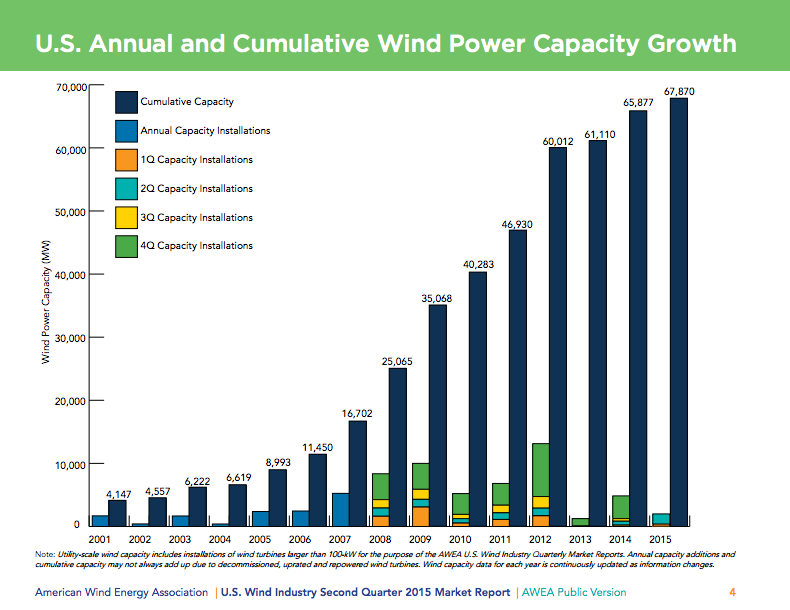 July 2015: With 1,661 megawatts of new wind turbine capacity coming online during the second quarter of 2015 and more than 13,600 MW under construction, wind power growth in the U.S. is at near-record levels. The American Wind Energy Association’s Second Quarter Market Report shows that 1,994 MW were installed during the first half of 2015, more than doubling installations from same period in 2014 but still below the record growth of 2012, when more than 2,900 MW was installed in the first half of the year. One of the most notable trends so far this year, AWEA noted, is the growing interest by Southeastern states in building and purchasing wind power, including announcement for new projects in Florida and North Carolina, the latter’s first venture into utility-scale wind. Looking forward, more than 100 wind projects are under construction in 24 states, representing more than 13,600 MW of total wind capacity and over $20 billion worth of private investment. July 2015: As part of an effort to beef up energy security, U.S. interests are funding the construction of a 20 MW solar plant in Jamaica, The $60 million project, which will create 400 construction jobs and another 20 long-term operations jobs, is expected to cut Jamaica’s use of imported fuel oil by 3 million gallons a year. It is being funded by the federal Overseas Private Investment Corp., which also is bankrolling construction of a new wind farm in Jamaica. “We do not intend to forever remain hostage to imported fossil fuel and all the challenges that it brings,” Jamaican Prime Minister Portia Simpson Miller said. July 2015: Implementing the Clean Power Plan in Virginia could result in lower electricity bills that save customers in the state up to $145 a year, according to a new analysis. 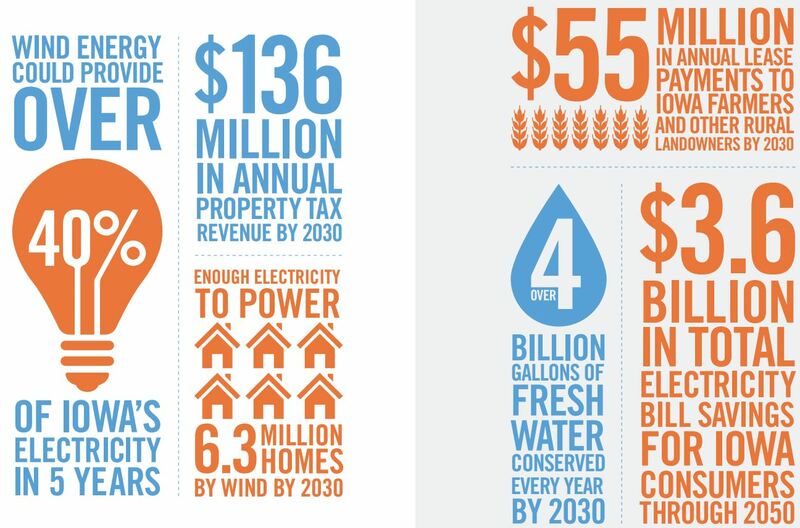 In contrast to alarmist projections for cost increases made by Dominion Power, the report by the group Public Citizen group indicates that power bills could drop about 8% if state lawmakers focus on energy efficiency for Virginia’s implementation of the Clean Power Plan. The state has efficiency goals, the group said, and broadening them would result in lower bills for most households even if electricity rates rise slightly. June 2015: Japanese telecom giant Softbank has committed to investing around $20 billion in solar projects in India through a partnership with Indian and Taiwanese enterprises. Coal currently dominates India’s energy mix, but the Indian government has set a goal of expanding the country’s solar output 33-fold to 100 gigawatts by 2022. June 2015: Nationwide, more than 9,800 clean energy and clean transportation jobs were created during the first three months of 2015, according to data compiled by the nonpartisan business group Environmental Entrepreneurs. The growth is almost double the number of jobs E2 tracked in the same quarter of 2014. 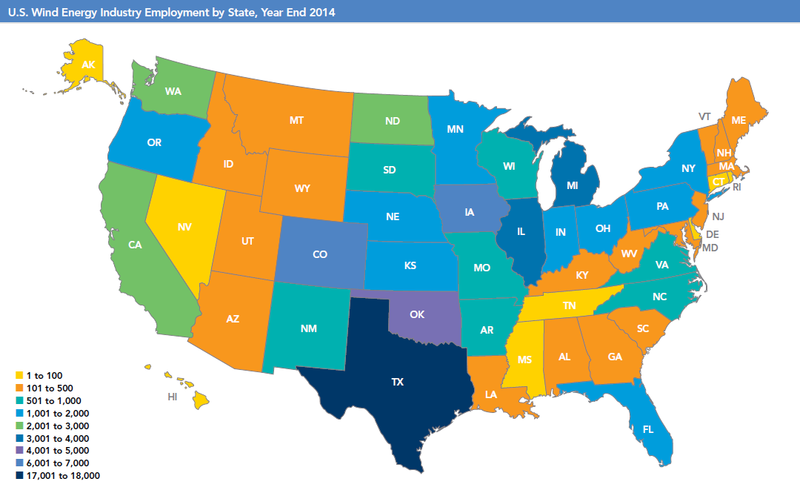 The top three states for job growth in the clean energy sector were: Georgia (2,870 jobs), California (1,885) and Texas (1,612). 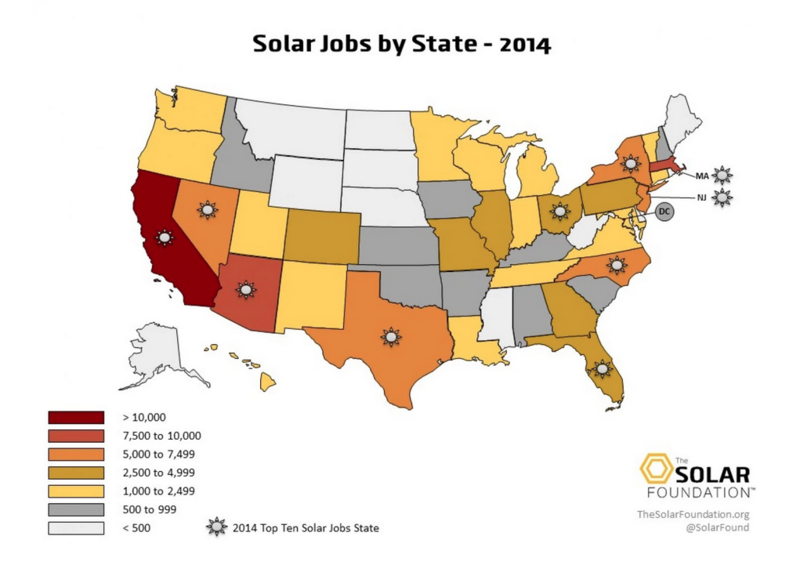 Nationally, solar was the top sector in Q1, with more than 6,600 new jobs announced. June 2015: Iowans could save $3.6 billion on their electricity bills over the next 35 years if the state expands its already healthy wind capacity, according to a new report by the American Wind Energy Association and the Wind Energy Foundation. Iowa already gets more than 28% of its electricity from wind, U.S. Department of Energy data show, which supports around 7,000 well-paying jobs. By 2020, wind could supply more than 40% percent of Iowa’s electricity, generating $49 million in annual property tax revenue and more than $19 million a year in lease payments to farmers and rural Iowa landowners. “In Iowa, we understand that an investment in wind power is an investment in jobs,” U.S. Rep. David Young (R) commented regard the report. 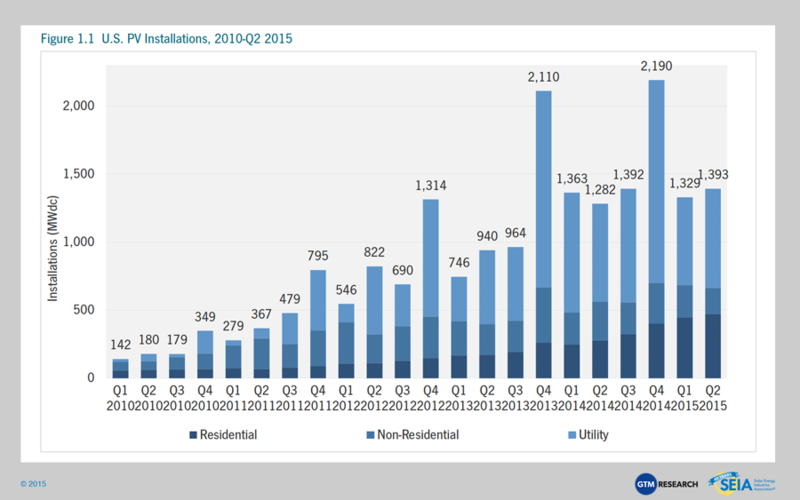 June 2015: Over the first quarter of 2015, the U.S. residential solar market grew 76% over the same period a year earlier, shattering installation records. Nationwide, companies installed 437 MW of rooftop solar PV in the first three months of 2015 – a total of 66,440 new home rooftop systems – according to a market report from the Solar Energy Industries Association. Little slowed the growth, including one of the worst winters in the Northeast’s history, yet the residential solar market had its biggest quarter of all time. 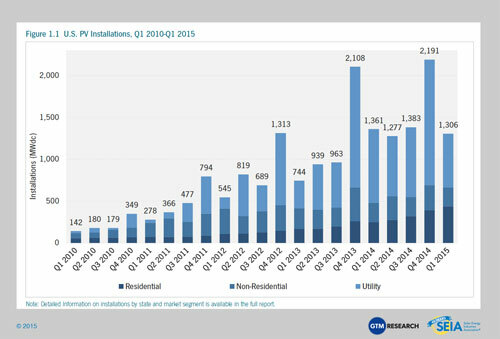 During the quarter, solar accounted for 51% of all new electric generating capacity. The average cost for a residential solar system also fell to $3.48/watt, a 10% decrease from 2014. June 2015: With solar continuing to sprout up all across the state, California would rank sixth in the world in installed solar capacity if it were a nation, says Rhone Resch, president and CEO of the Solar Energy Industries Association. 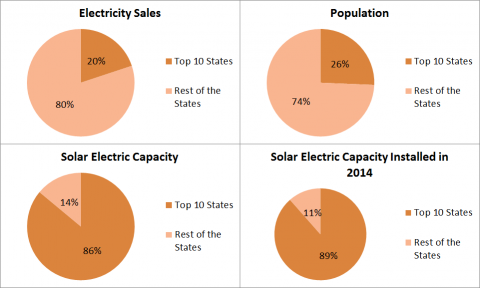 In a column in RenewableEnergyWorld.com, Resch pointed to SEIA’s Q1 solar market report showing that California has more solar assets than the United Kingdom, France, Spain, Australia and Belgium, and is the first state in the U.S. to top 10,000 megawatts of installed solar capacity — enough to power nearly 2.6 million homes. To that in perspective, the state has 10 times more installed solar capacity today than the ENTIRE U.S. had in 2007. June 2015: Far surpassing expectations, philanthropic groups, pension funds and other institutional investors have committed $4 billion toward a White House initiative to shift the world to a low-carbon economy. 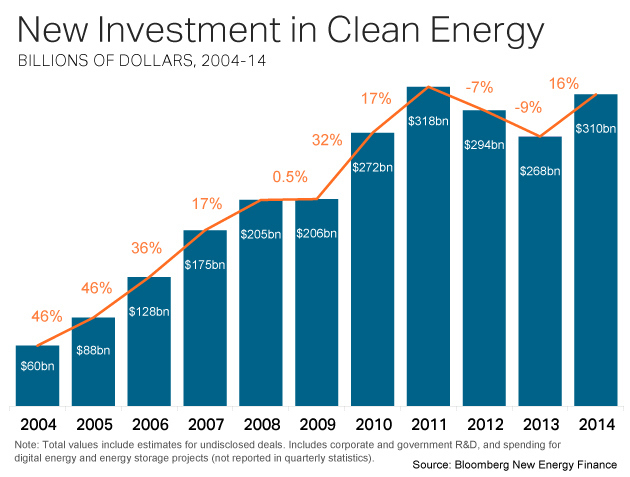 The investments, announced at a White House clean energy investment summit, double the goal of $2 billion that the Obama Administration set out earlier this year and will be invested in projects such as technological fixes to cut carbon. As part of the summit, the White House also announced a series of related executive actions to drive additional private-sector investment in solar, wind and other clean energy technologies. May 2015: Wind is usually what grabs the clean energy headlines in Iowa, but a school district in the southern part of the state is about to be completely powered by solar. In January, the WACO district installed an array of PV panels at an elementary school in Crawfordsville, which the district’s superintendent has saved about $20,000 in power costs this year alone. This summer, workers will add another set of panels to the junior-senior high building in Wayland, which will provide enough electricity to power more than 90% percent of the district’s needs. May 2015: According to a new comprehensive report, Illinois has added more than 7,500 clean energy jobs in the past 15 months. 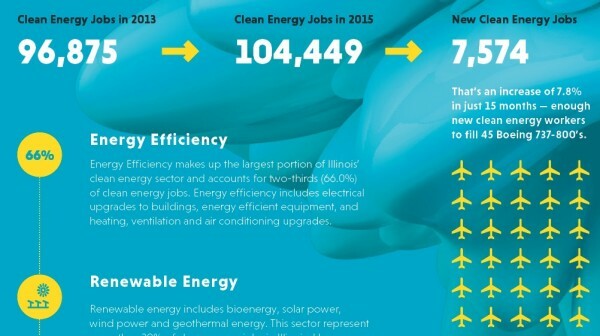 The Clean Jobs Illinois Report documented 104,449 clean energy jobs in the state – those connected with electric or alternative transportation fuels, greenhouse gas management, energy efficiency, wind power, geothermal, or solar power – up from just under 97,000 in late 2013. May 2015: Warren Buffett’s MidAmerican Energy has committed to spending $900 million on 552 MW of new wind energy projects in Iowa over the next two years, bringing the utility’s total wind assets in the state to $6.7 billion. Once built by the end of 2016, wind will supply a projected 57% of Mid-American’s retail energy demand. Republican Gov. Terry Branstad said because of Iowa’s “low electricity prices and commitment to renewable energy, major tech companies and other energy-intensive businesses are interested in locating and expanding facilities here.” Google, Facebook and Microsoft have sited large data centers in Iowa as a result of its affordable clean energy. A company spokesman said wind energy also reduces MidAmerican’s reliance on coal, which protects customers from rising costs tied to stricter environmental standards, including carbon limits. May 2015: Under a bill passed last week by the Hawaii legislature, Hawaii could become the first state to get all of its electricity from renewable energy sources. If Gov. David Ige signs the measure into law – he has until the end of June – Hawaii would have the most ambitious energy goals of any state, aiming to convert to 100% renewable energy by 2045. Hawaii has no fossil fuel reserves and must import coal and oil for power generation, leaving residents paying some of the highest rates in the country. April 2015: Buoyed by the 2014 extension of the production tax credit on wind turbines, the U.S. enjoyed a revived “wind rush” in 2014, with records for output and jobs and according to the Annual Market Report from the American Wind Energy Association. The U.S. wind industry added 23,000 jobs in 2014, boosting the sector’s total to 73,000 jobs. Of those, 20,000 are manufacturing jobs at more than 500 facilities across 43 states. Four times more new wind generating capacity came online in 2014 than the previous year, and 2015 began with 12,700 MW of wind projects under construction, a record for the start of any year. Wind generation in the U.S. has more than tripled since 2008, providing 4.4% of the nation’s electricity in 2014. April 2015: Wind energy avoided the consumption of more than 68 billion gallons of water in the United States in 2014, according to data from the American Wind Energy Association. The savings were equivalent to conserving roughly 215 gallons per person in the U.S. or 517 billion bottles of water. In drought-ravaged California, wind energy saved 2.5 billion gallons of freshwater in 2014, while Texas led the nation with savings of 13 billion gallons of water. April 2015: President Obama has announced an initiative aimed at helping cut carbon emissions by boosting support for the solar industry. The goal of the initiative, which will be run through the Department of Energy, is to train 75,000 solar workers by 2020. It also includes as a component a Solar Ready Vets program that will utilize the GI Bill to train military veterans for the solar workforce at 10 U.S. military bases. 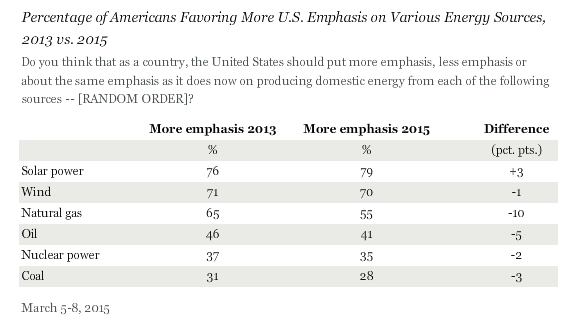 April 2015: In a national survey, American homeowners are overwhelmingly unified in their support of clean energy. The poll, conducted for Clean Edge and SolarCity, found that 87% of Americans believe renewable energy is important to the country’s future. 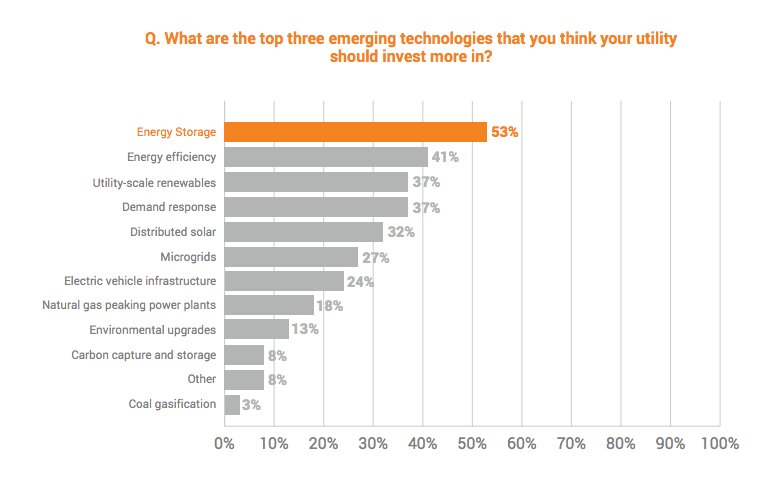 Solar was the top choice when respondents were asked which energy sources are most important to the nation’s future, followed by wind, natural gas and energy efficiency. Coal and biomass received the least support. The support for clean energy crosses geographic, political and social boundaries. 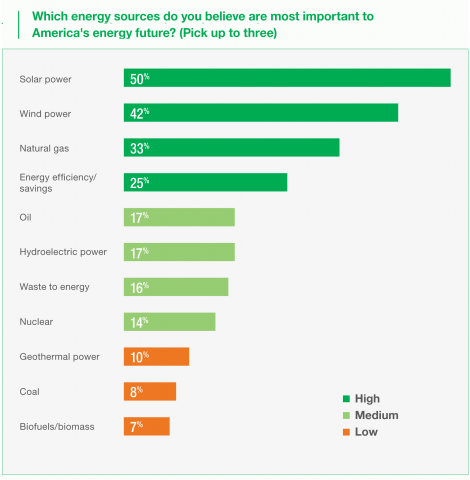 Solar power, for example, was the top choice among most of the demographic groups in our survey, including Republicans, Democrats, Independents, conservatives, liberals, city and rural dwellers, youth, and the elderly, as noted in a column by Clean Edge’s Ron Pernick in Renewable Energy World. April 2015: Analysts expect developers to install a record 4.2 gigawatts of offshore turbines in 2015, according to Bloomberg New Energy Finance, doubling the 2.1 gigawatts added in 2013. 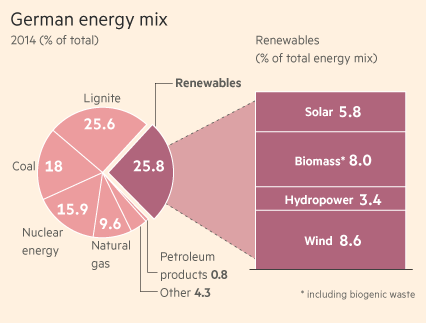 Germany is expected to lead offshore installations, accounting for more than half the total. Some of the new capacity results from delays in projects last year that will be completed this year, but offshore technology is also maturing, BNEF told Renewable Energy World in an interview. Worldwide offshore wind power is expected to reach 48 gigawatts by 2020. “Offshore wind installation is increasing year-on-year until at least 2020. There’s increased confidence that the technology is working and the cost of the technology is coming down,” a BNEF analyst said. April 2015: Three rural electric cooperatives are among the national leaders in providing solar power, according to rankings compiled by the Solar Electric Power Association. Co-ops in Iowa, Tennessee and Utah ranked in the top 10 for solar watts per customer, SEPA reported in its annual snapshot. Solar is attractive to rural electric co-ops for a number of reasons, but locally generated energy is one of the main ones. “Solar power is helping us keep our members’ dollars local,” said Warren McKenna, CEO and general manager of Farmers Electric Cooperative in Kalona, Iowa, which ranked second nationally and meets 20% of its demand with solar and wind. April 2015: Collectively, competitors in the EPA’s fifth-annual Energy Star Battle of the Buildings saved more than $50 million in energy costs by instituting programs that cut energy use last year by the equivalent annual energy use of more than 37,000 homes. One hundred teams entered more than 5,500 individual buildings in the competition, and together they reduced energy use by an average of 6%, or nearly $20,000 per building. The winner, a team from the small town of Woodville, Ala., cut average energy use in five buildings by 25%, freeing up $2,000 for street improvements and other town services. April 2015: By substantial margins, Nevada voters support solar energy and a proposal to raise the limit on the amount of solar that homeowners, businesses and schools are paid for. Of the 300 likely voters surveyed in the poll, which was paid for by a consortium of solar companies, 84% said have a favorable impression of solar, and 70% said they support the net metering policy. Solar developers are pushing the Legislature to raise the cap on net metering from 3% to as much as 6%, saying the policy helps create jobs and compensate solar customers for the energy they contribute to the grid. NV Energy, the state’s biggest utility, is fighting the proposal. 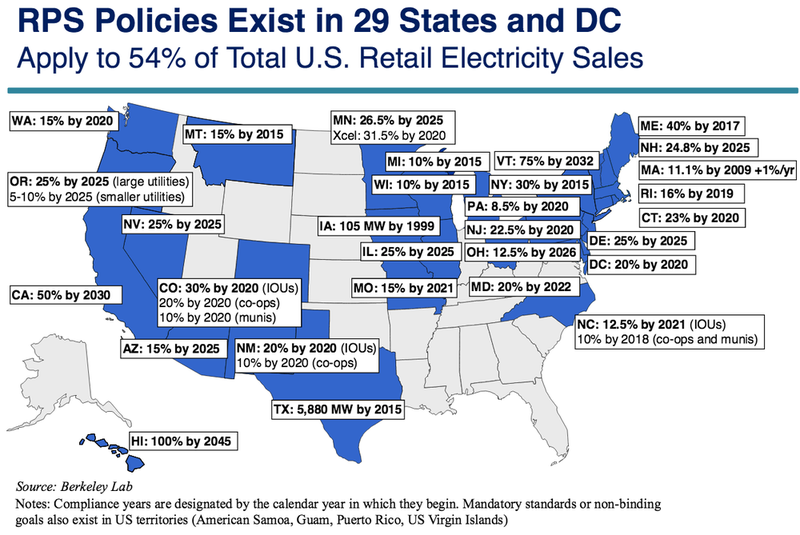 March 2015: A new analysis shows that in the top 10 states with the greatest share of renewable energy, average retail electricity prices are on par with or slightly cheaper than the 10 states with the smallest share. The study by clean energy fund managers DBL Investors did not draw a direct correlation between renewables and electricity prices, but rather showed that leading clean energy states leading have not experienced disproportionate price growth, as some critics imply, the authors said. In their analysis, the top 10 renewable states had an average increase in retail electricity prices of 3.06% between 2002 and 2013. The bottom 10 states had a 3.74% increase. “The cost curves are coming down for renewables. And they will continue to come down as markets grow and technologies achieve economies of scale. It is a virtuous cycle,” one of the authors told The Denver Post. March 2015: Clean energy is becoming mainstream for Fortune 500 companies and those that invest in renewable energy and cutting their carbon emissions are saving more than $1 billion a year, according to a new study. Published Ceres, WWF, Calvert Investments and consultants David Gardiner & Associates, “Power Forward, How American Companies Are Setting Clean Energy Targets and Capturing Greater Business Value,” found that 43%, or 215 of the companies in the Fortune 500, have set targets to cut CO2 emissions, boost renewables or improve energy efficiency. Among the Fortune 100 companies, 53 report that their investments in on climate and energy projects are collectively saving $1.1 billion annually. March 2015: Keeping step with rival retailer Wal-Mart, Target has announced that it will install large solar PV systems on the roofs of 180 stores and distribution centers in 12 states, about 10% of the company’s locations. On average, there will be 1,700 panels per site, with a combined output across all locations of 100 MW of electricity that will meet 20-30% of each facility’s demand. The panels will actually be installed and owned by Connecticut-based Greenskies Renewable Energy; Target will buy 100% of the electricity generated “at a fixed and sharply discounted rate for the length of the contract.” The projects are expected to be complete by the winter of 2016. 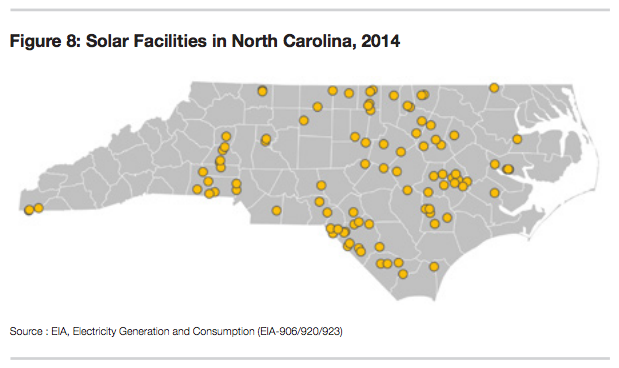 Walmart solar PV systems on 250 of its U.S. stores. March 2015: With a number of new large solar projects coming online – including including two 550 MW plants, the 377 MW Ivanpah project and a 250 MW plant – California has become the first state to get more than 5% of its electricity from utility-scale solar power. According to the U.S. Energy Information Administration, large-scale solar generated 9.9 million megawatt-hours of electricity in 2014, triple the amount from 2013. The data show that California’s solar production was more than all other states combined, and more than three times as much as Arizona, which came in second place for 2014. 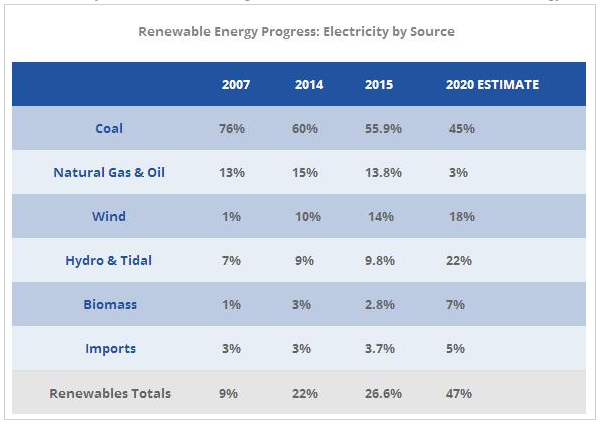 March 2015: The latest projections compiled by the U.S. Energy Information Administration indicate in 2015, renewables and natural gas will make up the vast majority of new more than 20 GW of new generating capacity that utilities expect to add to the power grid. EIA data show that 9.8 GW of wind are in the pipeline to be switched on this year, 6.3 GW of natural gas, and 2.2 GW of solar. Together, they comprise 91% of total new capacity expected this year. 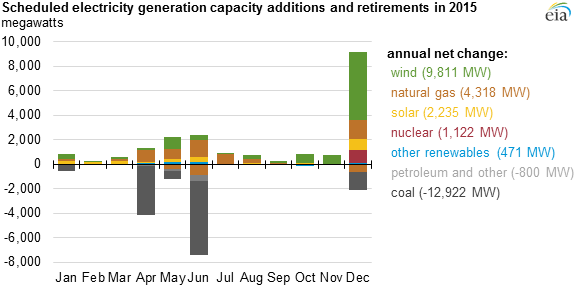 Conversely, EIA data show nearly 16 GW of generating capacity on the drawing board to be retired this year, with 81% of the total (12.9 GW) coal-fired generation. March 2015: A new report by analysts at Deutsche Bank projects that solar will become the dominant electricity source globally over the next 15 years as prices continue to drop, displacing large amounts of fossil fuel. As reported in Renew Economy, the analysis says that by 2030, the solar market will increase ten-fold, adding more than 100 million new customers. Solar energy already costs the same or less than conventional fossil fuel-generated energy (grid parity) in more than half of all countries, and within two years, it will be at parity in around 80% of the countries worldwide. “Over the next 5-10 years, we expect new (solar) business models to generate a significant amount of economic and shareholder value,” the Deutsche Bank analysts wrote. March 2015: In a radio interview on March 20, Wisconsin’s lieutenant governor acknowledged that states working to cut their carbon pollution and emphasizing the development of clean energy have a “competitive advantage” over states like Wisconsin that are fighting to maintain their reliance on coal. Republican Lt. Gov. Rebecca Kleefisch was criticizing the Obama administration’s proposed Clean Power Plan, which will sharply cut carbon pollution from power plants, when she said that Wisconsin’s refusal to move away from coal, which provides about 60% of the state’s electricity, hurt her state’s competitiveness. Neighboring states like Iowa and Minnesota have invested heavily in ramping up their wind and solar capacity. March 2015: For the first 75 days of 2015, Costa Rica got 100% of its energy from renewable sources, according to the state-run Costa Rican Electricity Institute. Hydroelectric power makes up the majority of the country’s renewables, and heavy rains have helped the country avoid using any fossil fuels at all so far this year. Fortuitously for residents, the boost to renewable capacity also has helped lower electricity rates by 12% percent. Costa Rica has a goal of becoming carbon-neutral by 2021. March 2015: A poll conducted by conservative clean energy advocates in North Carolina has found overwhelming support for solar, wind and energy efficiency in the state, regardless of party affiliation or ideology. 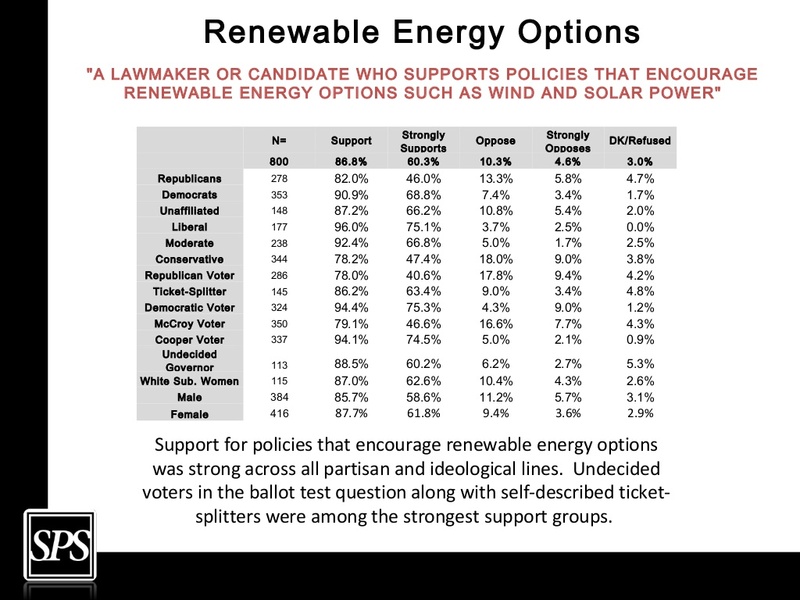 In a survey of 800 North Carolina voters, the group Conservatives for Clean Energy found that 87% said they would support a candidate who favored policies that encourage renewable energy, including 82% of Republicans, 91% of Democrats and 87% of unaffiliated voters. Similarly lopsided support was seen for tax incentives for renewable energy and the state’s renewable energy standard. February 2015: Utility-scale solar had its best year ever in 2014, with the installation of more than 3.7 GW of new capacity from 109 projects, 10% higher than the 3.4 GW installed in 2013. In total, there are now 10.6 GW of utility-scale solar capacity operating in the U.S., according to SNL Energy Notable projects included the 280-MW Abengoa Mojave Solar, the largest built last year, and the 255-MW phase four of the Topaz Solar Farm, which brings the total capacity of the PV project to 567 MW, making it the largest solar farm in the world. February 2015: There were a record number of wind turbine installations worldwide in 2014, according to data from the World Wind Energy Assocation. In all, more than 50 GW of capacity were added last year, bringing total global wind power capacity close to 370 GW. China led the pack, installing 23 GW on new wind in 2014, the largest amount a country has ever added in one year, followed by Germany and the U.S. Brazil joined the top five, the first time a South American country has cracked the top 10 in wind energy (a full list of leading wind countries is available here). Half of the top 12 countries set records for new capacity. February 2015: Jobs in the solar industry in the United States grew 10 times faster than the overall economy, according to The Solar Foundation’s 2014 State Job Census. As of November 2014, the solar industry employed 173,807 workers (in installation, manufacturing, sales and distribution), a 22% jump from the previous year. 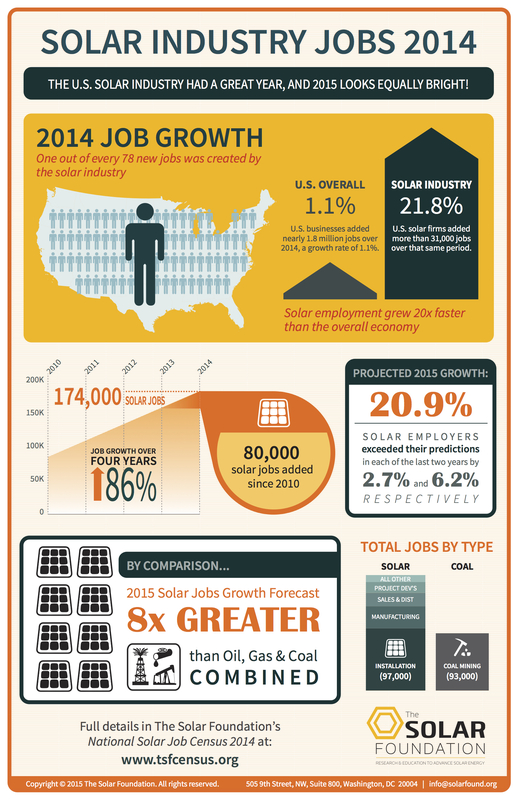 Notably, solar job growth is significantly outpacing the fossil fuel industry. Solar jobs now outnumber coal mining jobs 2-to-1 and are quickly catching up to jobs in oil and gas extraction, the report noted. The coasts are well represented, with California’s 54,700 jobs ranking number one and Massachusetts number two at 9,400 jobs. February 2015: In separate deals, Apple has cemented its leadership position on clean energy in the high-tech sector. In the U.S., Apple has signed the largest clean energy agreement ever for a commercial end-user. The computer giant will pay $848 million to buy 130 megawatts of power from First Solar’s 2,900-acre California Flats solar PV project for 25 years. Construction on the project is scheduled to be complete by the end of 2016. In Europe, Apple has announced a plan to build two data centers that will be powered 100% by renewable energy. One center will be built in Viborg, Denmark and be powered mainly by wind energy. The other, in County Galway, Ireland will be powered partly from biomass. Both data centers are expected to open by 2017. 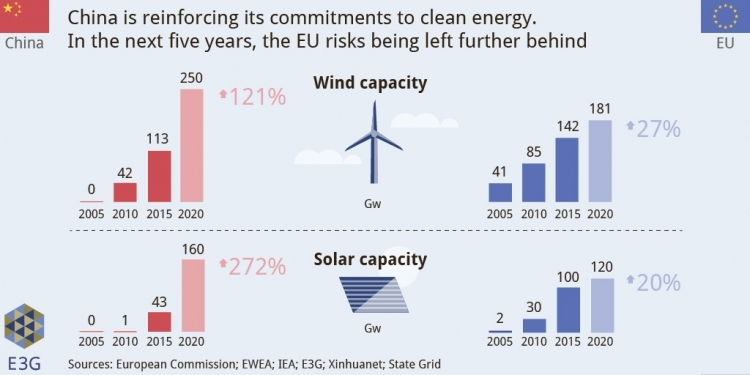 February 2015: The European Union is on target to achieve its goal of 20% renewable energy by 2020, according to a report from the European Environment Agency, which analyzed data from 2013. Some nations, such as Britain, the Netherlands, and Luxembourg, are their targets with less than 5% energy from renewables, while Austria, Finland, Sweden and Latvia are all above 30%. Hydropower (42.6%) and onshore wind (26.2%) provided the majority of electricity from renewables, with percent and 26.2 percent, respectively. 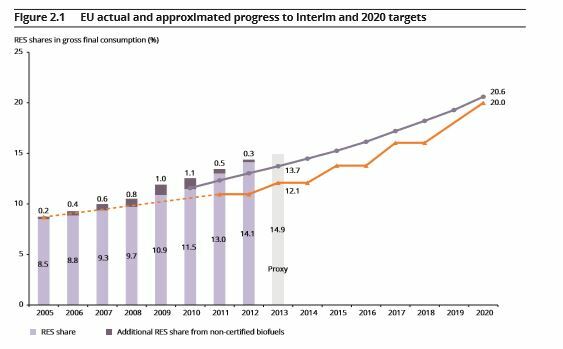 Beyond 2020, EU countries have agreed to a 27% renewable target by 2030 and 55-75% percent by 2050. “We can go even further: if we support innovation in this area [renewable energy] could become a major motor of Europe’s economy, bringing down emissions while creating jobs,” said EEA Executive Director Hans Bruyninckx. February 2015: South Africa’s renewable energy program helped save the country more than $450 million in energy costs in 2014, according to a recent study by the Council for Scientific and Industrial Research. The country’s 600 MW of wind and 1 GW of solar capacity was helped along by subsidies totaling $390 million, leaving a net ‘profit’ to the economy of around $60 million. Electricity generated from renewable projects replaced more than 2 terawatt-hours of electricity generated by diesel- and coal-fired power plants. February 2015: Data from a survey of solar installers and manufacturers in Washington state show that every dollar of incentives provided to owners of solar PV systems injected $2.46 back into the economy in 2013. Solar Washington collected the data to gain insight into the industry’s impact on Washington’s economy. For 2013, state incentives of $19.6 million resulted in $48.2M in economic impact, including $25.4 million in payroll and $21.5 million in equipment purchases from in-state suppliers. “Based on the data we’ve gathered, solar incentives in Washington State pay for themselves many times over and are a boon to the state economy,”said David Nicol, president of Solar Washington’s board. New government policies at both the national and state levels that promote clean energy, chief among them the Obama administration’s Clean Power Plan and its bilateral climate pact with China. Energy-intensive industries such as data centers gravitating to the U.S. due to favorable energy economics. Major new infrastructure, including natural gas pipeline expansions and widespread deployment of smart grid technologies. Increased capital flowing into financial vehicles such as green bonds specifically aimed at sustainable energy development, which will help raise the huge amounts needed for buildout. February 2015: Construction is expected to begin soon in India on what will eventually be the world’s largest solar facility. The 750-megawatt plant in Madhya Pradesh, which is scheduled to come online in August 2016, will generate enough electricity to power roughly 2 million Indian homes. All told, India has plans to install around 100 gigawatts of solar power by 2022, which would boost the nation’s solar capacity 33-fold, second only to China. A large chunk of that will come from U.S.-based SunEdison and First Solar, which have committed to building more than 20,000 megawatts of clean energy capacity in those seven years. Reuters reports that SunEdison will build 15,200 MW of solar and wind power capacity by 2022, while First Solar made a commitment to develop 5,000 MW of solar by 2019. The government of Prime Minister Narendra Modi has made renewable energy a priority. “We have no option but to make a quantum leap in energy production and connectivity,” Modi said of the country’s solar goals. February 2015: Worldwide solar capacity has mushroomed by more than 50x in less than 10 years as the price of solar energy has fallen exponentially. In the U.S., this has led to the construction of around 630 solar plants of 1 MW or bigger in size between 2008-2013, equating to a 1,200% increase in capacity, or about 6,000 MW, in just five years (Click the map below to watch the growth year by year starting in 1983). That is enough electricity to power roughly 1.7 million homes, and according to DOE forecasts, the trend of exponential growth will continue, with solar expected to power around 4 million homes by 2017. January 2015: Although there is some quibbling about the accuracy of how Burlington, Vt. counts its renewable energy supplies and whether it truly is the nation’s first 100% renewable city, there is little doubt the state’s capital is making huge strides in clean energy and saving its residents money in the process. In an interview with NPR, an official at local utility Burlington Electric said that switching from fossil fuel energy to renewable energy will likely save Burlington about $20 million over the next two decades and that unlike other cities in the U.S., where electricity costs have increased, the city’s rates haven’t gone up since 2009. Most of Burlington’s ‘renewable energy’ comes from hydropower, about a third from a biomass facility that burns scrap wood, and the remaining 20% from wind turbines and solar panels. January 2015: Installations of wind power in the United States surged sixfold in 2014, adding 4.7 GW of new onshore wind capacity last year, compared with just 764 MW a year earlier. According to an analysis by Bloomberg New Energy Finance, much of the growth can be attributed to the extension of the Production Tax Credit in January 2013. Total U.S. onshore wind installations are now 64.2 GW, second only to China, which also saw record wind growth in 2014, with turbine installations rising 38 percent, or 20.7 GW, from a year earlier. January 2015: At an auction last year for resources to meet future electricity demand for the the largest electric grid operator in the United States, the winning low bid went not to coal, gas or even renewable energy like wind or solar. 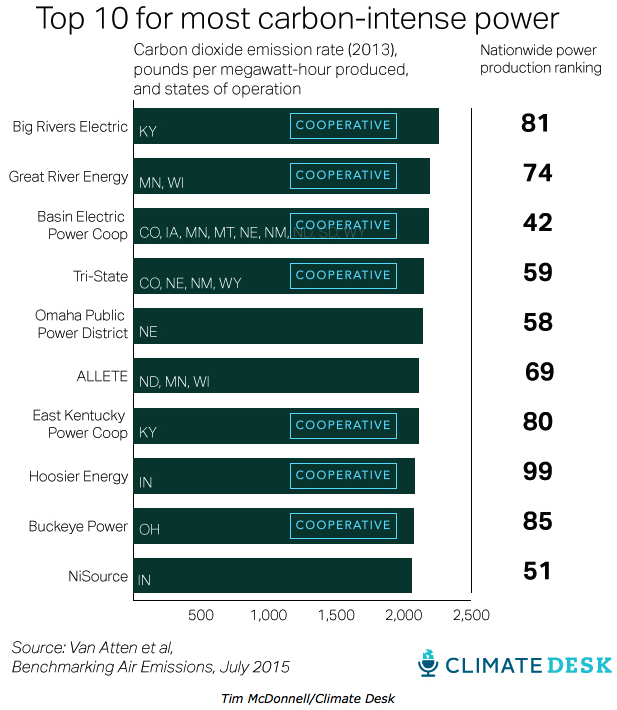 According to a report in LiveScience, the most competitive bid for meeting new electrical capacity in the PJM Interconnection, which supplies electricity to 13 northeastern U.S. states and the District of Columbia, was energy efficiency. So-called “demand-response” measures aimed at reducing peak demand will supply 47.5% of all new electrical capacity for PJM in 2017–2018. January 2015: A new report by the International Renewable Energy Agency says that biomass, hydropower, geothermal and onshore wind are all competitive with or cheaper than coal, oil and gas-fired power stations, even without financial support and despite falling oil prices. “Any remaining perceptions that renewable power generation technologies are expensive or uncompetitive are at best outdated, and at worst a dangerous fallacy,” said IRENA’s director-general Adnan Amin. “Renewable energy projects across the globe are now matching or outperforming fossil fuels, particularly when accounting for externalities like local pollution, environmental damage and ill health. … The game has changed; the plummeting price of renewables is creating a historic opportunity to build a clean, sustainable energy system and avert catastrophic climate change in an affordable way.” IRENA said that the biggest cost declines are coming from solar PV, which have fallen 75% since the end of 2009. And analysts expect that trend to continue. 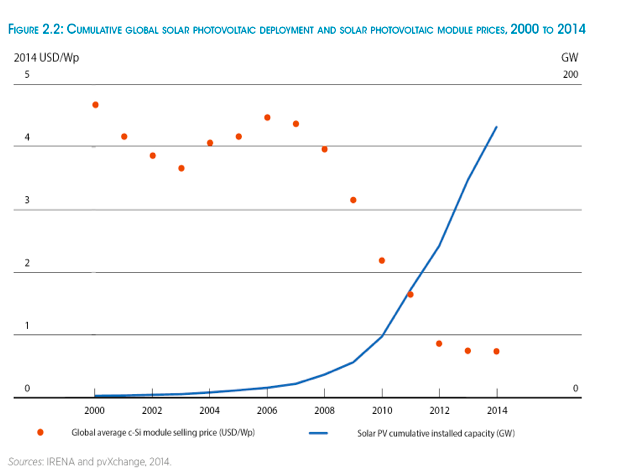 Due to improvements in energy efficiency and economies of scale and falling financing and manufacturing costs, Deutsche Bank analysts project that solar prices will fall 40% below current prices within two years to around 50 cents per watt, while SunEdison and other manufacturers have projected panel prices to drop to as low as 40 cents per watt by the end of 2016. January 2015: As the collapse in oil prices leads to the cancellation of tens of billions of dollars in oil projects, oil rich Saudi Arabia is developing solar at record-low prices. Last week, a Saudi firm signed an agreement to provide electricity from a 200-MW project it is developing in Dubai at a cost of $58 per megawatt-hour for the next 25 years, reportedly the lowest price ever for a utility-scale PV project. with Chile, Honduras and Mexico leading the field. January 2015: By 2030, the global battery storage market will have grown to $400 billion, according to projections by Citigroup analysts. A trifecta of demand for expanded battery storage – from consumer electronics, electric vehicles, and combination of renewable energy and smart grids – will promote rapid growth in the industry Citigroup said in a report on global investment trends for 2015. 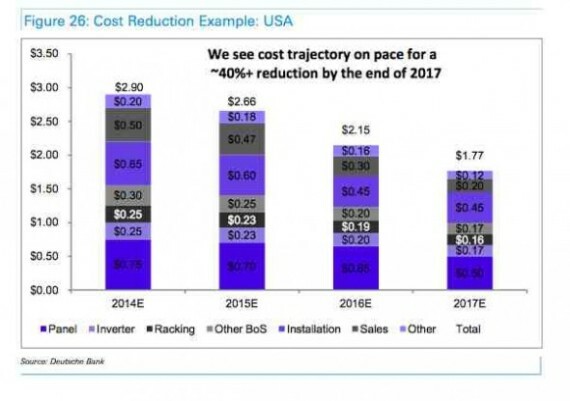 The analysts also foresaw a scenario for the cost of battery storage similar to that driving steep cost declines in solar: “falling costs lead to increased deployment, leading to further cost reductions.” Citi estimated that storage costs could fall ultimately fall to $150 per megawatt-hour, which would eliminate the need for subsidies. January 2015: Few industries have fared as well as solar in the six years since the 2008 Recession. Data from GTM Research shows that the United States installed 22 times more solar in 2014 than in 2008, adding 5.7 gigawatts of PV and concentrating solar, compared to only 263 megawatts six years prior. That means, according to Greentech Media’s Stephen Lacey, that a new solar installation is now being completed every two and a half minutes in the U.S., up from one every two hours a decade before. One company, SolarCity, is installing almost as much solar capacity in one quarter as the entire industry put on-line in all of 2008. January 2015: Orders for General Electric wind turbines increased 26% over 2014, with almost 40% of the company’s 3,227 total orders coming in the final quarter of the year, a 61% increase over the fourth quarter of 2013. Company executives project further sales increases for 2015. January 2015: Two recent announcements by Florida utilities will dramatically increase the Sunshine State’s solar capacity. Florida Power & Light has plans to build three projects totaling 225 MW in the coming year in south Florida, tripling the utility’s solar output and providing enough electricity for roughly 40,000 homes. More importantly, FP&L said that the economics of solar have improved to the point that customers will not see any rate increase related to the projects. “[O]ur analyses have determined that the plants can be built without resulting in net costs to our customers over the facilities’ operating lifetimes,” spokeswoman Sarah Gatewood said. Gulf Power also has made a commitment to boosting its solar capacity substantially. In joint ventures with the Navy and Air Force, the Southern Co. subsidiary plan to build solar plants, totaling 120 MW, at three military installations in the Panhandle by the end of 2016. Florida currently has only 229 MW of solar installed statewide. January 2015: Canada’s wind energy sector saw record growth in 2014, adding 1,871 MW of new capacity during the year. According to the Canadian Wind Energy Association, the country now has a total of 9,698 MW of windpower installed nationwide, enough to meet the annual electricity demand for roughly 3 million Canadian homes. Projections are for Canada to add at least 1,500 MW of new wind power capacity this year. January 2015: Exceeding already optimistic growth expectations, the solar industry created jobs at a rate nearly 20 times faster than the economy overall last year, accounting for 1.3% of all jobs created in the U.S. in 2014. According to The Solar Foundation’s National Solar Jobs Census, as of November 2014, the solar industry employed nearly 174,000 workers, an increase in jobs of 22% since November 2013. 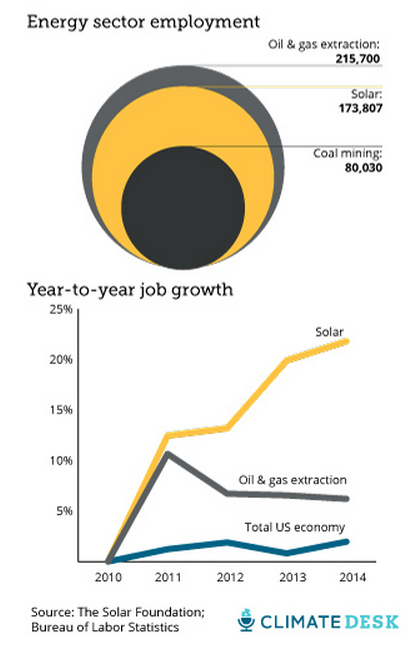 Solar jobs now outnumber older, well-established industries in the energy sector, including coal mining (93,185 jobs). The solar sector also added nearly 50% more jobs in 2014 than the total created by both the oil and gas pipeline construction industry (10,529), and the crude petroleum and natural gas extraction industry (8,688). January 2015: Lighting and other electricity needs for Super Bowl XLIX at the University of Phoenix Stadium in Glendale, Ariz. will be powered by 100% renewable energy. Through a $1 million sponsorship agreement with the NFL, Arizona-based Salt River Project will provide in-kind services and enough renewable energy credits to cover all the energy used for the game on Feb. 1. January 2015: Anchored by big leaps in the cost competitiveness of solar, approval of new offshore wind projects in the U.S., and China’s expanded commitment to renewables, global investment in clean energy rose to near-record levels in 2014. 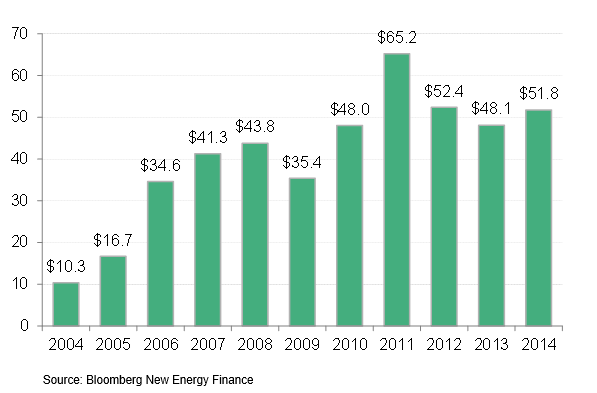 According to an analysis by Bloomberg New Energy Finance, total clean-energy investment jumped 16% last year to $310 billion, more than five times the amount invested just a decade earlier. The market’s performance was just shy of the record $317.5 billion invested in 2011. “Throughout last year, we were predicting that global investment would bounce back at least 10% in 2014, but these figures have exceeded our expectations,” Bloomberg analyst Michael Liebreich said in a statement. solar system is a better investment than the stock market, and in 42 of these cities, the same system already costs less than energy from a residential customer’s local utility. Mix of EE, renewables and hydro a fix for high energy prices in Mass. January 2015: A report commissioned by the Massachusetts Department of Energy Resources has found that by prioritizing energy efficiency, renewables and imports of Canadian hydroelectricity, the state can insulate itself from spikes in energy prices in the winter. Conducted Synapse Energy Economics, the analysis is intended to assess investments in clean energy as a means of reducing over-reliance on natural gas. The region’s natural gas infrastructure is insufficient to meet demand during peak winter use, which leads to high electricity prices. January 2015: Solar systems will reach grid parity in up to 80% of the global energy market within two years, according to projections by Deutsche Bank. The forecast assumes that electricity prices will continue rising across the world and that solar costs will continue their downward trend, but even if electricity prices don’t climb, the bank estimates solar will still be cheaper than current conventional energy for two-thirds of the world. Unsubsidized rooftop solar electricity costs 13-23 cents per kilowatt-hour, well below retail electricity prices in many markets globally. “We believe the trend is clear: grid parity without subsidies is already here, increasing parity will occur, and solar penetration rates are set to ramp worldwide,” Deutsche Bank analyst Vishal Shah was quoted saying in Clean Technica. January 2015: As part of efforts to diversify its heavy dependence on oil and gas, Mexico expects to see investments in wind farms reach $14 billion between 2015 and 2018, almost quadrupling the country’s installed capacity to 9,500 megawatts. According to a report in Reuters Mexico’s state-run electricity company CFE plans to develop eight wind farms that will generate 2,300 MW at a cost of some 52 billion pesos ($3.55 billion). January 2015: Last year, during the frigid polar vortex that froze much of the country early in the year, wind energy saved consumers in 13 Mid-Atlantic and Great Lakes states more than $1 billion on electricity bills by protecting them from extreme price spikes, according to an analysis by the American Wind Energy Assocation. Extreme temperatures from the Arctic blast on Jan. 6 and 7, 2013, created unusually high demand for electricity and natural gas, driving prices for both to dozens of times their normal levels. AWEA analyzed grid operator data and fuel price information for every power plant in the region to determine how much more electricity prices would have increased had wind generation not been online. Because there are zero fuel costs, wind is insulated from market price spikes, and AWEA determined that customers in the 13 states save $408 million on Jan. 6 and $601 million the following day because comparatively wind was available. 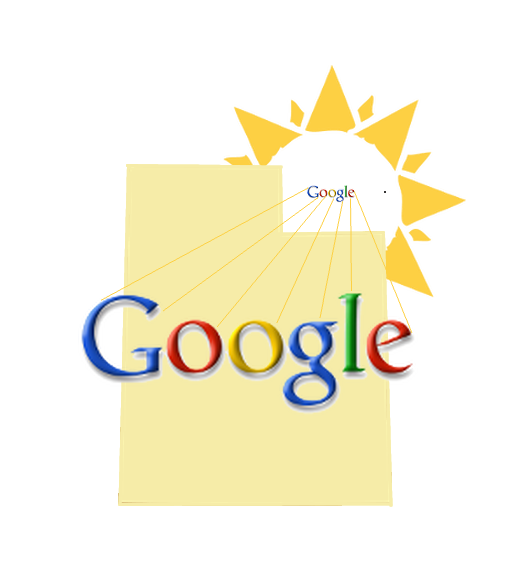 January 2015: Google is investing $157 million to build the largest solar plant in Utah. Being developed jointly by Google and Norwegian power company Scatec Solar, the 104-megawatt project will generate enough electricity annually to power roughly 18,500 homes. In exchange for its majority investment, Google will receive tax incentives and a share of the project’s income. The plant will be Google’s 18th renewable energy project worldwide, some powering the company’s massive data centers and others, like the one in Utah, built simply as a means of generating healthy investment returns. “We’ve invested over $1.5 [billion] in bringing new sources of renewable energy to the grid and have no plans to stop,” a Google spokesman said in an email to E&E News (subscription only).